The Sydney Smart™ Back Outlet Dual Flush Toilet by Caroma™ adds contemporary style and water conservation to any bathroom. This dual flush high efficiency toilet (HET) features unique two button activation providing substantial water savings compared to other HET or standard toilets, and smooth rounded contours for easy cleaning. The Round Front Plus bowl has been designed with a 4" rear outlet rough-in. The tank incorporates a high performance outlet valve which has been specially developed with the Round Front Plus bowl to ensure optimum flushing performance. Due to the substantial water saving benefits achieved by the 1.28 / 0.8 gpf (4.8 / 3 lpf) dual flush system, this toilet is suitable for multi-purpose applications where water conservation is important. This complete toilet consists of tank (622322W), bowl (609450W), seat (326222W) and outlet connector (M-14-64-020). 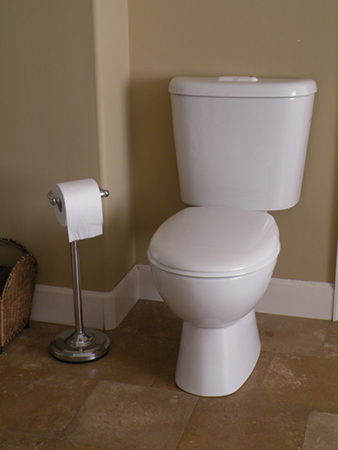 View Sydney Smart™ Back Outlet Round Front Plus Toilet specifications, installation instructions and informational brochure. The Sydney Smart™ Series is the latest addition to the Caroma line of dual flush toilets and features an average flush volume of .89 gallons per flush, the lowest water consumption of any toilet in the market today. Combining a Sydney Smart water-conserving toilet with a coordinating Caroma sink saves money while preserving the world's most valuable resource - water.